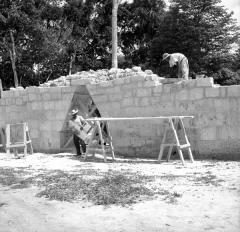 Results 1 - 15 of 97 for "stela or stelae"
Caption: Masons working on stela enclosure, May 1960.
Credit: John Rick, University of Pennsylvania Tikal Project Negative 60-26-232, All rights reserved. University of Pennsylvania Museum. 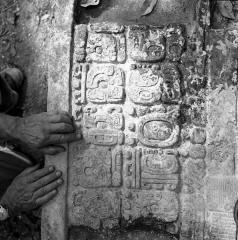 Caption: Uolantun Stela 1, back, top, 1956.
Credit: Edwin Shook, University of Pennsylvania Tikal Project Negative 56-1-79, All rights reserved. 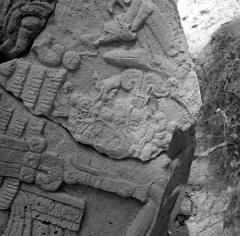 University of Pennsylvania Museum. 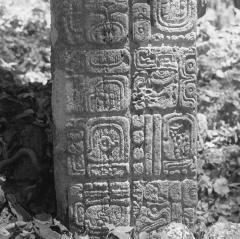 Caption: Uolantun Stela 1, front, top, 1956.
Credit: Edwin Shook, University of Pennsylvania Tikal Project Negative 56-1-82, All rights reserved. University of Pennsylvania Museum. 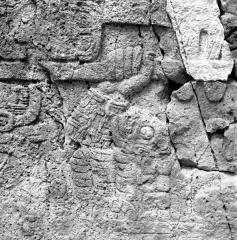 Credit: George Holton, University of Pennsylvania Tikal Project Negative 56-3-110, University of Pennsylvania Museum. All rights reserved. 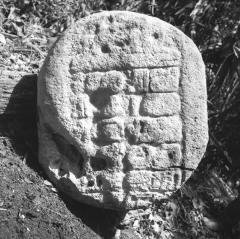 Caption: Stela 19, in situ in Structure 4E-43, spring 1956.
Credit: Linton Satterthwaite, University of Pennsylvania Tikal Project Negative 57-2-15, All rights reserved. University of Pennsylvania Museum. 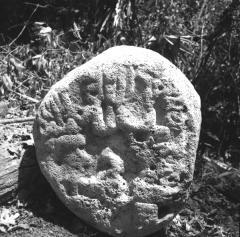 Caption: Stela 5, left side detail, March 3, 1957.
Credit: William R. Coe, University of Pennsylvania Tikal Project Negative 57-4-149, All rights reserved. 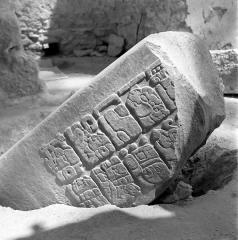 University of Pennsylvania Museum. 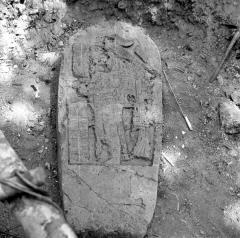 Caption: Stela 20, general view with Alfred and Mary Kidder, April 14, 1957.
Credit: William R. Coe, University of Pennsylvania Tikal Project Negative 57-4-263, All rights reserved. University of Pennsylvania Museum. 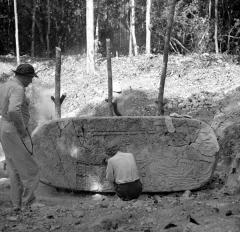 Caption: Stela 20 detail, April 14, 1957.
Credit: William R. Coe, University of Pennsylvania Tikal Project Negative 57-4-264, All rights reserved. University of Pennsylvania Museum. 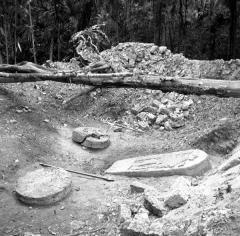 Credit: William R. Coe, University of Pennsylvania Tikal Project Negative 57-4-265, All rights reserved. University of Pennsylvania Museum. 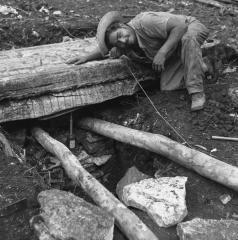 Caption: Workman posing by Stela 6 before it was raised, March 1958.
Credit: Linton Satterthwaite, University of Pennsylvania Tikal Project Negative 58-2-62, All rights reserved. University of Pennsylvania Museum. 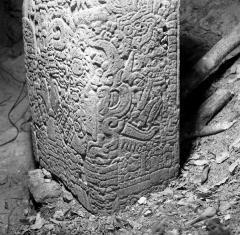 Caption: Stela 2, front, night shot, March 1958.
Credit: William R. Coe, University of Pennsylvania Tikal Project Negative 58-4-270, All rights reserved. University of Pennsylvania Museum. 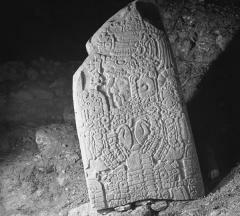 Caption: Stela 2, side view, night shot, March 1958.
Credit: William R. Coe, University of Pennsylvania Tikal Project Negative 58-4-297, All rights reserved. University of Pennsylvania Museum. 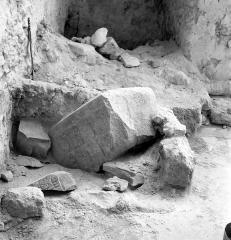 Caption: Stela 26 in Structure 34 rear room, 1958.
Credit: William R. Coe, University of Pennsylvania Tikal Project Negative 58-4-437, University of Pennsylvania Museum. All rights reserved.